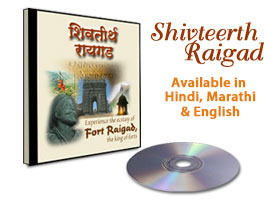 Shivteerth Raigad is around twenty minute video journey of Fort Raigad. It recreates the glory of the fort and its valiant inhabitants and brings alive the heroic tales of Shivaji Maharaj. Watch as the scenes from history unfold before your eyes in this spellbinding masterpiece. Available in Marathi and Hindi versions.